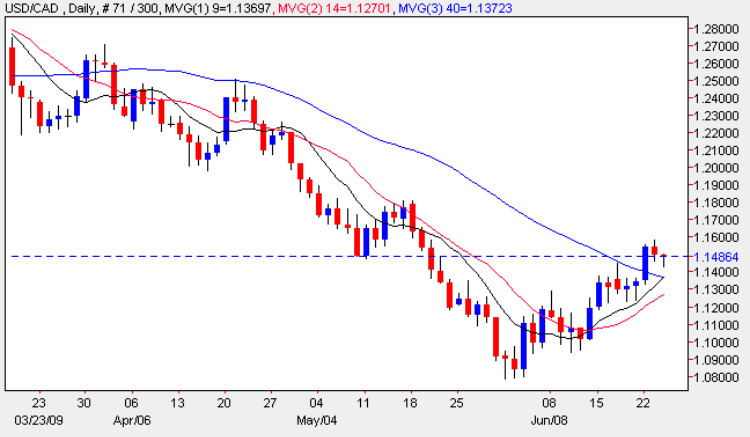 Following Monday’s widespread up bar and break through above both the 40 day and resistance at the 1.14 level, it was no surprise yesterday that trading was restricted to a relatively narrow range with the candle closing as a “spinning top” and with a red body. The strong reversal to the upside has now been firmly established and this seems likely to be reinforced in due course with a bullish cross of the 9 day and 40 day moving averages which appears imminent on the daily chart. The key to any sustained rally will be a break and hold above the 1.17 price level and should this be achieved then we may even see a re-test of support in the 1.2 area in due course. However, this technical picture has to be judged against the wider economic landscape which, of course, is dominated later today with the long awaited and much vaunted FOMC statement and interest rate decision in the US. All the indicators are pointing to further pressure on the US Dollar as are the majority of traders, analysts and speculators but this view would appear to be contradicted by the technicals for the dollar to cad pair. This is hardly surprising given the nervous and febrile nature of the markets at present and also highlights one of the contentious issues of currency trading which is simply whether you can indeed trade solely on technical factors or whether you must heed the wider fundamental picture. My view, for what it is worth, is that you need to blend the two and in situations such as today the contradictions are evident in many different charts.